Have an animal-loving kiddo in your family? Don’t miss sending them to our Unleashed Camps during school vacation weeks and summer break! Both educational and fun, camp programming is designed to teach children age-appropriate animal welfare topics and curriculum. Daily activities include hands-on interactions with shelter animals, educational games, arts and crafts projects, guest speakers and more. Held in our humane education classroom at our new adoption and community center, Unleashed Camp is a tail-wagging adventure for all ages. School vacation and holiday camps offer local students in-shelter, hands-on programming during the December, February and April school vacation weeks as well as in-service days and school holidays. Divided by grade, campers K-4 and 5-8 have separate days during the vacation week, and age-appropriate curriculum and learning objectives. 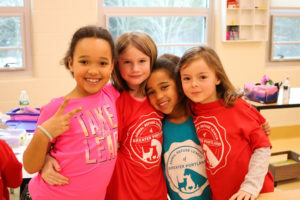 Check back in the fall for 2019-2020 school year vacation/holiday camps! Our 2019 Unleashed Summer Camp is designed differently than past summers. This summer, each week will be designed by camper’s age group and by animal species, allowing our curriculum to dive deeper into the types of animals we care for and learn about! We will also be offering three weeks of arts-specific camps, to take place in our ARLGP barn. Please read the details below thoroughly, to decide which week is best for your camper. We are excited for this new, expanded programming, and anticipate a summer full of furry fun and frolic! Our 2019 high school camp will be limited to 3 students a day on June 24th, July 8th, July 15th, July 22nd, July 29th. This camp will be service-learning based, and offer a comprehensive, hands-on experience of how the ARLGP runs through every department. Please download and submit our high school application by May 15th, if your high schooler is interested in participating in this new day program. Please note: This program is designed for students with a passion for animals and who likely will want to work with animals in the future. Camp registration opens online March 1st at 10am. Camps fill quickly, often selling out within hours of open enrollment. We will have an educator in the office as well if you would like to sign up over the phone at (207) 517-3939. Regular Camp day is from 9am-4pm. Please note: we cannot guarantee a peanut-free environment at the ARLGP, because of the daily products used feeding our animals. Additional questions before open enrollment? Please email education@arlgp.org. Dog Camp: In this dog-themed camp, students will get the chance to dive into the world of canines! We will learn about dog senses, training, jobs, and learn lots of dog-themed crafts and activities. We will welcome guest speakers who work with dogs in a variety of ways. Of course, we’ll meet and enjoy the company of many ARLGP pets along the way. If your child is looking for a barking good time, this camp is for them! Cat Camp: In this cat-themed animal camp, students will discover the world of felines! We will learn how our feline friends show their emotions, how to care for kittens, and what cats need to be safe indoors and outdoors. We will welcome guest speakers to talk all things cats. Of course, we’ll meet and enjoy the company of many ARLGP pets along the way. If your child is looking for a meowing good time, this camp is for them! 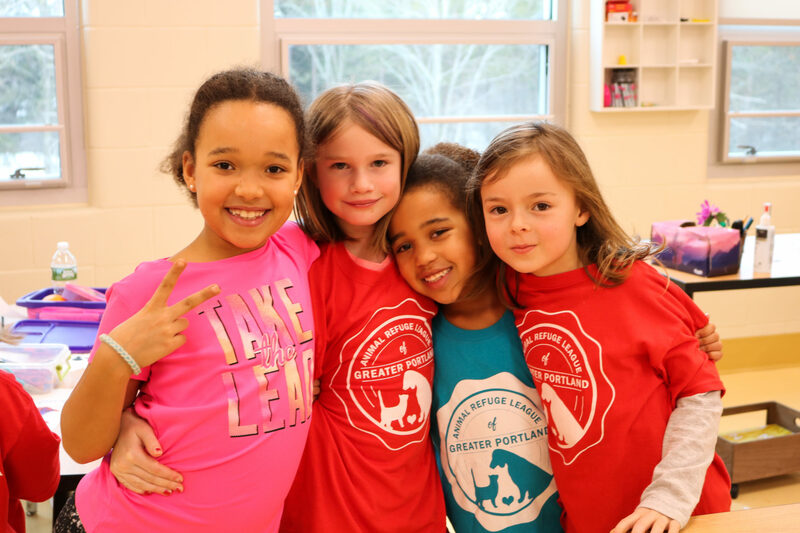 Critters and Beyond Camp: In the critters and beyond camp, students will go beyond the world of dogs and cats to discover other companion pets. We will learn about rabbits, guinea pigs, rats, mice, hamster, ferrets, hedgehogs and more. We will also have special guest speakers to discuss reptiles, birds, and barnyard friends. Of course, we’ll meet and enjoy the company of many ARLGP pets along the way. If your child is looking for a hopping good time, then this camp is for them! Preschool Camp: Designed for our youngest campers, our preschool camp will include lots of hands-on projects, motor activities, and time with our ARLGP animals. We’ll have fun with crafts, stories and activities too. We will be offering a half-day (9am-noon) and full-day option (9am-3pm), so feel free to choose what is best for your child. Art Camp: In this art-themed camp, students will learn all about how animals can be used in art to send a message and create awareness. We will spend time creating animal-related art pieces, all while learning about animals. When we aren’t creating animal art, we will spend lots of time meeting ARLGP animals, taking part in shelter helper projects, and hearing guest speakers talk all about different types of animals. If you love art and animals, this camp is purr-fect for you!